Due to their molecular structures and arrangements they are amorphous polymer materials, and that is why both of them have excellent optical properties, and the reason of why they have been used to laminate glasses for Architectural applications. But it is not just on matters of their optical properties why they can be used in Architectural applications, it is also because of their mechanical properties. Their elastic modulus properties give them the needed properties to dilute the glass-glass dimensional and thermal dilatation tensions when in operation under different weathering environments. For architectural constructions security is a critical parameter that always should be warranted regardless of the type of glass laminate. That is why, for example to construct balustrade walls, it is not allowed to be built them with just a single piece of glass. Legislation force to use laminated glass systems to insure that when by any reason there is a breakage of one of the glasses, the other one will be able to sustain the small glass pieces adhered to its surface. Safety is first and legislation protect users, by requiring the use of laminated glasses. The process of lamination is looking for implementing of the security element between glasses. The main objectives of the non-glass element is to provide flexibility to the structure an also a good adhesion of the glass in case of glass breakage. Either the PVB or the EVA are good materials for such a purpose. The differences between them show up in terms of their process-ability or the final mechanical properties (dilatation coefficients, young modulus, elastic modulus) of the product depending their final application and use. There is where the chemical and physical properties of both materials are important. The above mentioned differences in chemical composition and structure between EVA and PVB allow us the Chemist, Polymer Scientist and Chemical Engineers, play with the raw materials to convert and transform them into specific products with differential and desired performances. Even though it is true that we can manipulate these materials and “drive” them to behave in some extension along our desired performances, for such type of applications where safety is really important, any kind of “gummy materials” we might think to use, they are forced to reach some minimum value properties to fulfil the required security standards. Having said that, it is important to mention that not all EVA or PVB materials are the same. Under the acronyms of EVA and PVB many different performance products might be considered. It is important to distinguish all of them by looking at their PDS (Product Data Sheets) that manufacturers need to provide. This is an important information to know by the glass lamination companies in order to produce the highest quality lamination glass products according their lamination equipment and processes. But this is not all, at this point here it is important to point out that the relevant properties of the laminated product are the final ones, we mean the ones that any laminate product should fulfil after these materials are laminated and are verified by norms by qualified certification institutes. Another important property that needs to be fulfilled for this type of products is the adhesion to glass. As it has been previously mentioned, both polymer materials have acceptable intrinsic adhesion properties, but they can always be increased by the use of special additives to the corresponding polymer material. In principle EVA is a better adhesion material than PVB. PVB has an acceptable to low adhesiveness to glass. It has also a high higroscopicity. 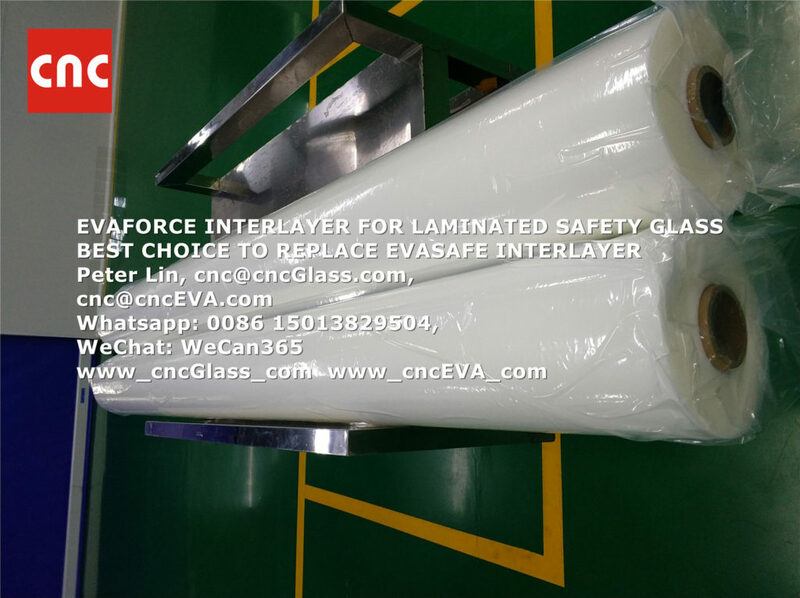 In terms of adhesion, besides EVA and PVB, other materials can be used to laminate glasses. But most of them are liquid products that require to mix up at least two different solutions to react. This is not an easy job from the lamination manufacturing point of view. Moreover, as a final product one might end up with a glass adhesion interlayer with different degrees of elasticity that might not fulfil the required mechanical properties needed to be a good a glass interlayer element. The EVA and PVB, intrinsically are being supplied as films, they are easy to handle and to manipulate in the preparation of the glass laminates before they are transformed and integrated as the flexible element of the structured product. The use of films in the lamination process is a great manufacturing advantage compared to the use of liquid materials, even if part of the excellent adhesion is not reached by the use of the films. One of the main differences between EVA and PVB is their water vapor transmission rate, coming from natural water or weather humidity. PVB has an average of 8-9 times higher tendency to permeate water than EVA. This property gives to EVA a great advantage compared to PVB in terms of transportation, storage and use. Not just that also in terms of product resistance against weathering conditions. Normally due to capillarity PVB laminates suffer from water penetration around the edges and glass lamination pieces angles affecting negatively the durability and the mechanical resistance of the laminate. Another important difference between these materials is that EVA, in contrast to the PVB, must be converted into a thermoset product during the lamination process. This process transforms the free and “soup of flowing molecules” in the mass into a chemically Crosslink EVA molecule. The lamination process, converts the interlayer material into an elastic, flexible, but at the same time into a structured and not any more temperature melted product. The laminated structure becomes a new stable and elastic interlayer between glasses that provides for the global structure with the required mechanical properties. The chemical transformation of EVA might take place in small ovens taking care of vacuum and temperature process control. The cost of the equipment needed is much lower than the one used normally for PVB. One of the great advantages of EVA is its lower water absorbing compared to the PVB, that allows to store and manipulate the film out of the climatic chambers where PVB needs to be manipulated before lamination. Moreover, due to the lower adhesivity properties of PVB this film needs to be processed in autoclaves, where the pressure applied to the lamination structures helps to improve the limited adhesivity properties of PVB. In the case of lamination of PVB, there is no chemical crosslinking process between molecules like it happens with EVA lamination processing.